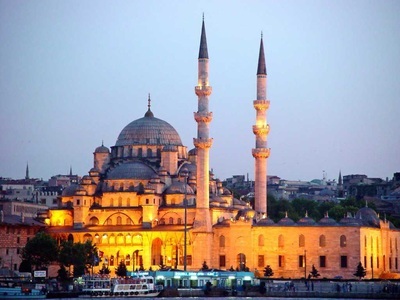 The New Valide Sultan Mosque was placed in between Hakimiye Milliye Street and Balaban Pier in the south of Uskudar beach which is located in Anatolia Side of Istanbul Bosphrous. It was built by Mehmet Aga of Kayseri by the order of Sultana Emetullah Rabia Gulnus Sultana (The mother of Ottoman Sultans Mustafa II and Ahmet III). 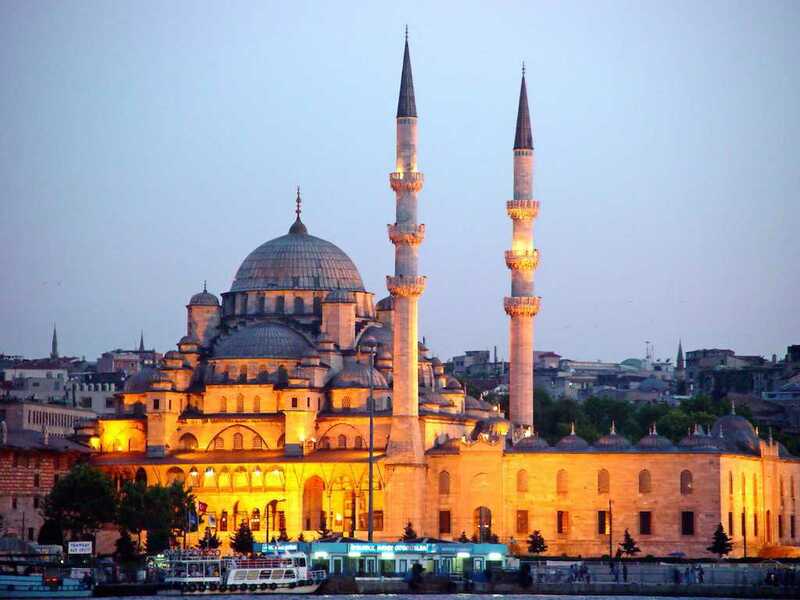 This glorious structure effects the visitors its perfect architecture. Square shaped mosque has a central dome with fascinating windows added on the frames of that dome. Low shaped dome is carried with eight arches. The first four arches are only flat shaped but the others are used in half dome.They were inserted on eight proportion in main place.Also it has two balcony and it is surrogated five doors.Every door is located in different ways. - The first door was named ''Bazaar Door'' (Carsi Kapisi in Turkish) because it is located in the bazaar way. - The second door placed accross the old Bit Bazaar was called Bat Bazaar Door or Sebil Yahut Hunkar Door. - The third door was well known as Arasta or Bedesten Door because it is opened to Arasta bazaar. - Fourth door in Balaban Street includes various name like Balaban , Cumle, Imaret or Mektep Door. - The last door is famous for the names of Uncular,Degirmen and Mescid Door. As it is seen that those doors were named according to their locations, and the mill stones once upon a time established here. It consist of social complex, hunker mahfili (gathering place) fountain, public fountain,mausoleum, muvakkithane, school, pool,water-tank with a fountain, cistern, Bedesten and Mesruta homes.Its sanctuary is found in the middle of the huge yard and has three doors. One of those doors is located in inside yard,the second in sadırvan yard and the last in cumle door. Every side of Sadırvan yard is placed 36 windows in both sub-section and upper part. Those windows were covered with classic iron bars and internal wooden. Surrogated three sides a portico with 17 domed carrying 14 marble columns, floor of that yard was covered with marbles. 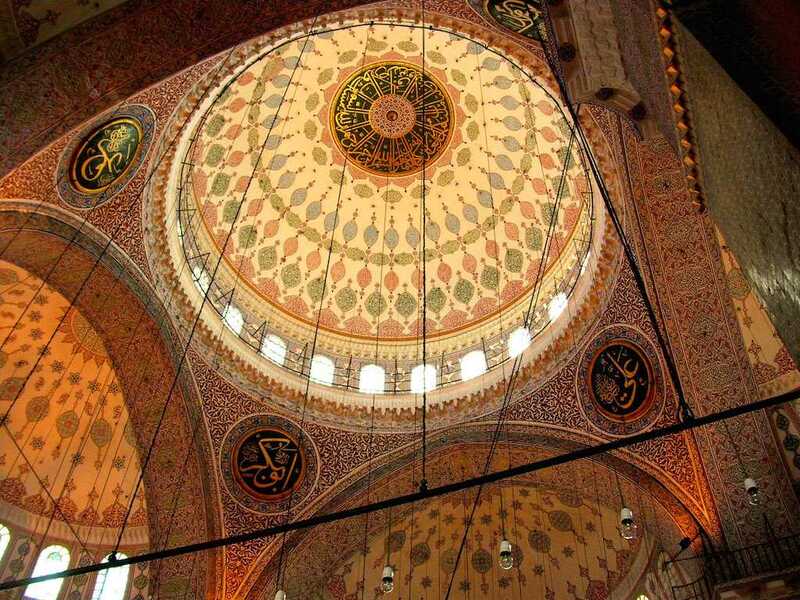 Being one of the best quality works, sadırvan was completely made of marble with eight parts. The marble columns were located in the corners of every part. 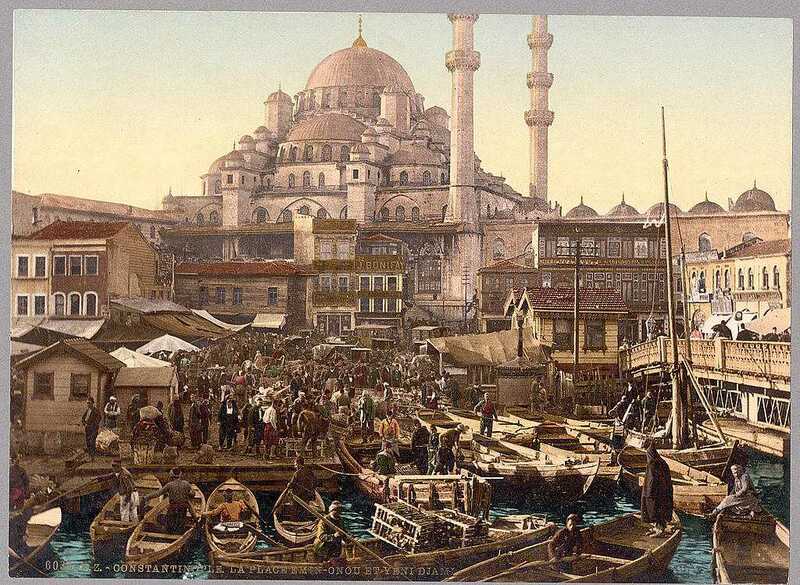 The New Mosque dominates the harbor next to the Galata Bridge on the Golden Horn. 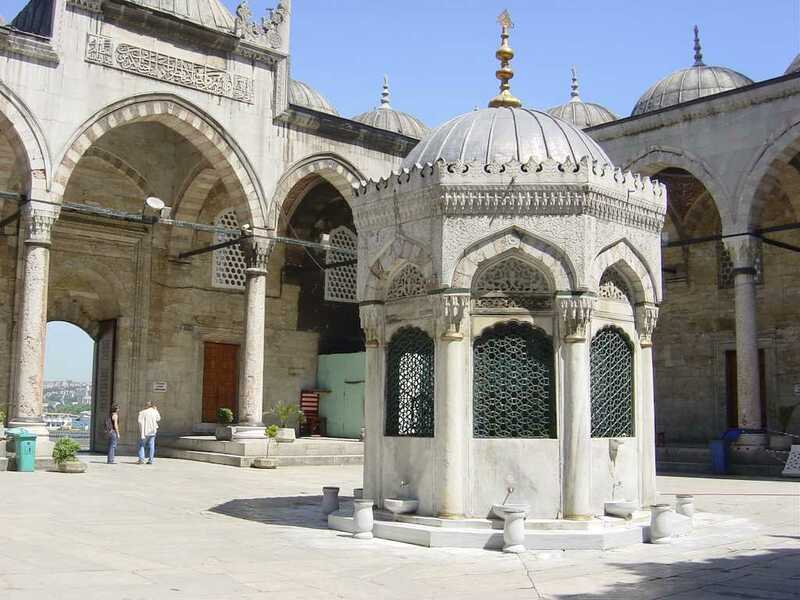 The beautiful exterior completes of a great courtyard, two slender minarets, and a cascade of domes tumbling down from a main dome. 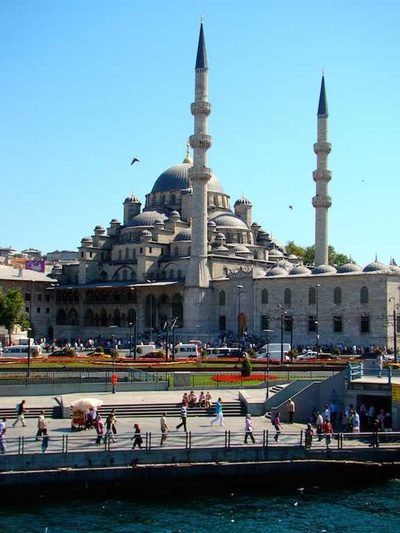 Hundreds of pigeons establish their nests among the architecture. 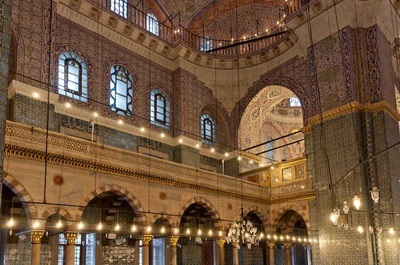 The interior is furnished with Iznik tile, gold and marble. Valide Sultan Turhan Hattice is buried in the courtyard along with sultans Mehmet IV, Mustafa II, Ahmet III, and Mahmut I.